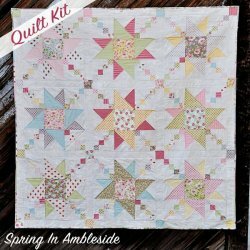 Create this adorable quilt using fat eighths. You'll turn them into squares and triangles. The binding will be made using up your scraps to create a scrappy binding. This quilt was quilted on a domestic machine with straight line quilting and it looks great! The pattern is complete with a cutting guide. 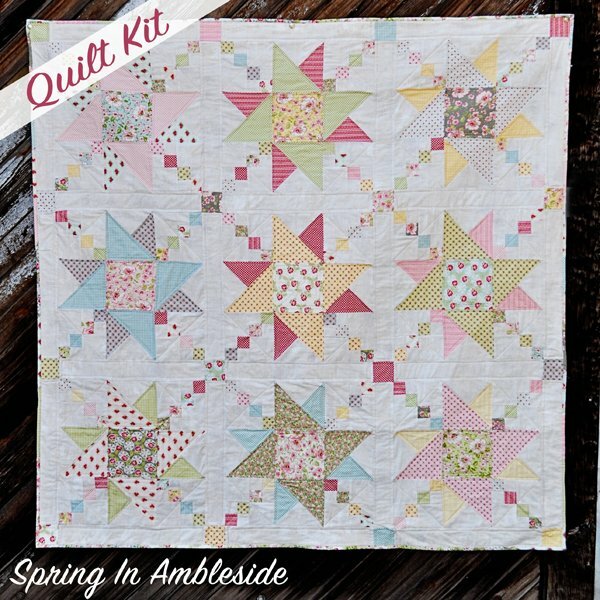 "We were introduced to this lovely new line of fabric called Ambleside by Brenda Riddle for Moda . I fell in love immediately! It was so lovely, delicate, and soft. I knew I had to design a quilt for this fabric!" "I am pretty darn smitten with how this turned out! My awesome mom pieced and quilted this quilt. She did such a great job! It is so beautiful in person, and the design translated so well into the quilt! I am so happy with how it turned out. She quilted this on her domestic machine, and kept the quilting very simple with straight line quilting. I love the simpleness of it, because it makes the fabric stand out and all the lovely prints just pop!"